My take on the different aspects within education which relates to ongoing societal concerns. 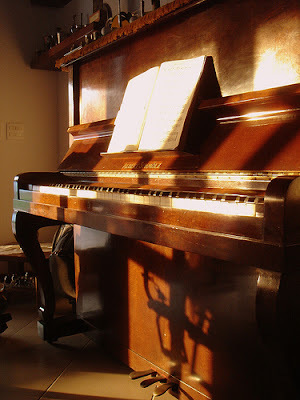 The Piano is the 1st instrument that I was introduced to as a child. It is also the 1st instrument that I have introduced to both Ryan & Roy. This instrument is normally the base instrument that one would learn before branching out to other secondary instruments Ie: Violin, Guitar, Flute. Whenever you strike a key on the piano, a felt hammer would have struck briefly at a particular steel string within the piano. The sound that is produced is a result of the metal string vibrating upon being hit. These vibrations are transmitted through a bridge to a soundboard that amplifies them. When you play a chord, two or more strings would be vibrating at the same time and the blended sound would be resonating from it. 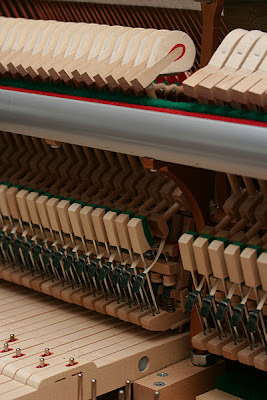 If you look at the bottom of the piano you would see 3 pedal in the centre. The pedal which you would use the most often would be the extreme right – Sustain pedal. It lifts the dampers from all keys, sustaining all played notes, and altering the overall tone.The leftmost pedal is the soft pedal. 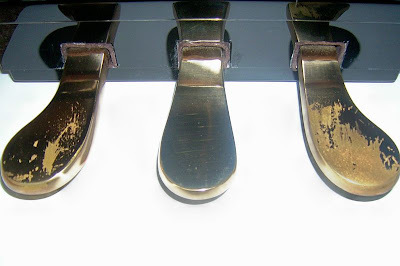 By stepping on this pedal, the hammers moves closer to the strings, allowing the hammers to hit the strings with less force and produce a softer sound.The middle pedal called the celeste pedal. This drops a piece of felt between the hammers and strings, greatly muting the sounds.However the middle pedal is seldom used unless you intend to play into the wee hours of the night and do not want to disturb the neighbours.For me getting my boys to learn the Piano at this stage is for them to enjoy music, develop their sense of co-ordination, ability to listen subjectively. It also helps in their right-brain training as it aids in them seeing the bigger picture between each and every piece that they play.A few months ago I posted on which piano method Ryan was using.